I have dinner parties on the mind lately. It makes sense, considering it’s officially the season of festive holiday parties and many of those are dinner parties. Now that I have my own office space and an 8-person dining table, I can’t wait to throw my first dinner party of the holiday season! Although, does Thanksgiving count? That’s a pretty big party! 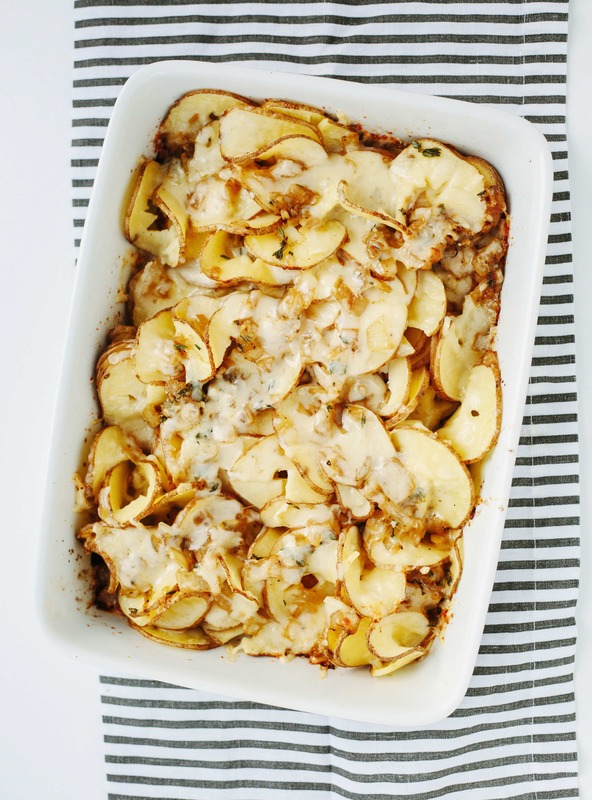 Today, I have an easy, flavorful, and beautiful spiral-y potato casserole that’s perfect for bringing to one of your soirees this holiday season! Rosemary, garlic, and thyme are my three favorite flavors to bake potatoes with. These seasonings really bring out the buttery flavor of potatoes, IMHO. 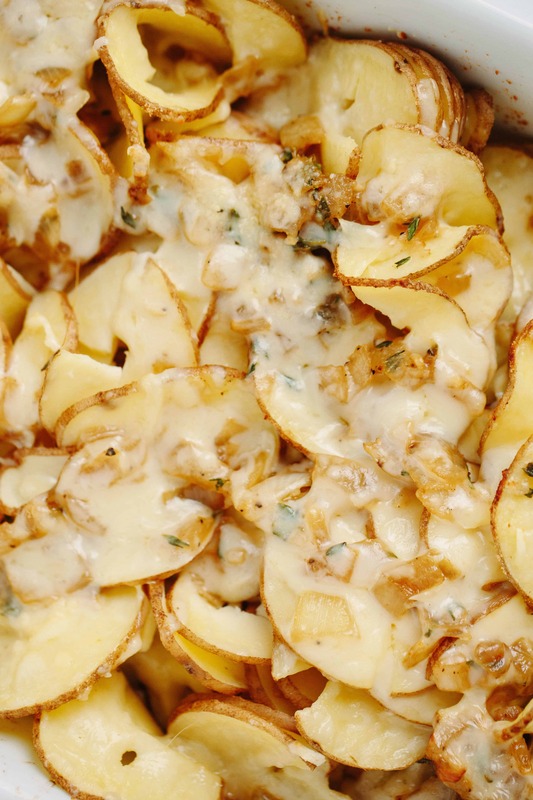 These potatoes are on a new level, baked with rich gruyere cheese and a dusting of Parmesan for an extra savory kick. AND, they’re beautiful – using Blade A on the Inspiralizer to make spirals, the potatoes are adorably curly. Potatoes are underrated, I think – most are just prepared in cubes or slices. If you bring this casserole dish to a dinner party, your friends will be thankful – and you won’t be tempted to grab that creamy, buttery potato gratin across the table. Tell me – what’s your favorite dish to bring to a dinner party? 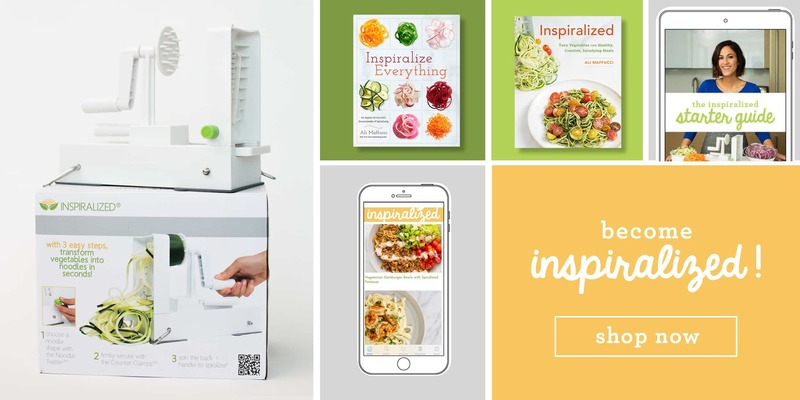 Maybe I can re-create it using the Inspiralizer! Minted is giving away a $125 gift card to TWO of my followers! To enter to win, all you need to do is enter the raffle here, by entering in your e-mail address. Giveaway ends December 11th, and I’ll be announcing the winner on Monday, December 12th! Good luck! Heat the oil in a large skillet over medium-high heat. Add the onion and cook for 5 minutes or until translucent. Add garlic and cook for another 1 minute or until fragrant. Add in the broth, season with salt and pepper and cook for 5 minutes or until reduced. Add the thyme and stir, then remove the skillet from heat and set aside. Meanwhile, spiralize the potatoes with Blade A. Then, grease a 9 x 13-inch baking pan with cooking spray. Lay out half of the spiralized potatoes in an even layer on the bottom of the pan. Top with half of the onion mixture, and then sprinkle evenly with half of the gruyere cheese. Top evenly with the remaining spiralized potatoes and the remaining onion mixture, and the remaining gruyere cheese. Top with parmesan cheese. Cover the baking pan with aluminum foil and bake for 60 minutes or until potatoes are cooked through. Remove and sprinkle with the remaining 1/2 teaspoon of thyme. Is it possible tomspiralize apples to make an apple pie? If so, do you have a recipe? Thanks so much. Hi Ali! This blog post couldn't have come at a better time for me! I have been looking for the past week for a spiralized potato casserole i could serve at a friend-mas dinner we are having Saturday. I happen to be one of those weird people who don't care for cheese, do you think it would turn out fine if I omitted the cheese from it, or only did it on half for others to enjoy? I think you can do half and half! It's better with the cheese, of course, but without, it's still a tasty way to eat regular potatoes! I couldn't have sent my mom the link to this recipe ANY FASTER!! Every year, I'm like.. ugh mom, those scalloped potatoes are so rich and so heavy and blah blah blah. But she makes them for my dad and brother.. and of course they are IMPOSSIBLE to resist. This is a great alternative!! Indulgent.. but MUCH lighter than the alternative!! (I don't see the calories or nutritional info listed.. just points.. am I missing something?) Thanks Ali! 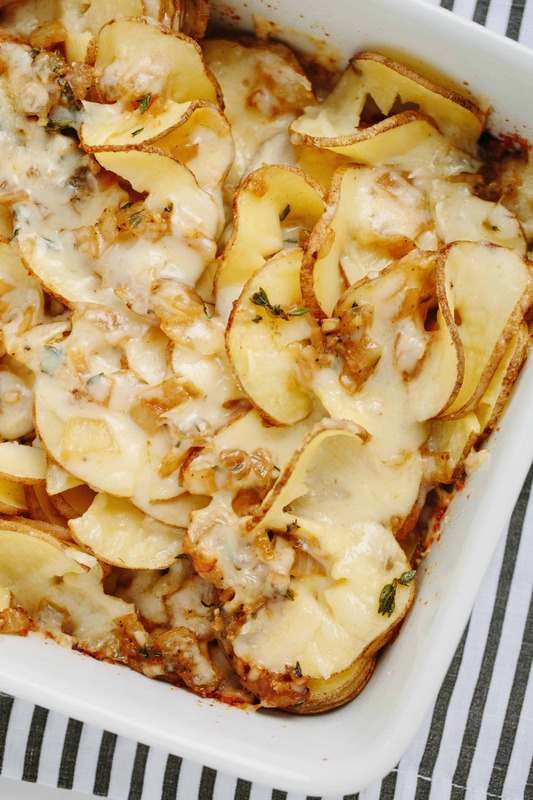 Hi Ali Is it possible to substitute another cheese in this potato thyme casserole?